-it will be held through the Milan Beach Resort this year. -will launch from Milan Beach. -fish from May 13th through July 1st. (eight weeks). -every Tuesday night from 6pm to 9pm. -$125.00 per boat/2 person teams. -limited to the first 24 teams. -can catch 8 fish but weigh 5 fish. -14" minimum (1lb penalty for shorties). -follow all state and federal laws. Please show up early the first night to go over rules and questions. BE SURE to send me your money to secure your spot. Cold front conditions and a 20 mph NW wind had the water looking like chocolate milk. 15 teams hit the water and "0" fish were caught. Hoping next week will be better! Week #2 of league saw 9 fish come to the scales. Eric and Adam Spray took top honors with 2 fish weighing 13.63 lbs. There big fish was 8.38 lbs. Second Place went to Jack Anderson and Corey Reiffenberger who weighed 2 fish for 12.44 lbs and a big fish of 6.56 lbs. Third Place was Brent Zupan and Tom Ludvigson who weighed 3 fish for 11 lbs. Fourth Place went to Kelvin Weber and Jeri Ruth who weighed 1 fish for 9.88 lbs and won the big fish award for the night. Rick and Brennen Longnecker also weighed 1 walleye for 3.06 lbs. Week #3 of league was another slow night. Only 6 fish were brought to the scales partly due to a severe storm that shortened the night for most of the anglers. Dave Cornelius and Jim Roth weighed 4.8125 pounds for the win and also had the big fish which was 3.1 pounds. Eric and Adam Spray were a close second with 4.375 pounds. While Stephen and Mickey Erickson placed third with 1.5625 pounds. Week #4 was a sign that there are a few walleyes left in the lake. 29 walleyes were brought to the scales. Jeri Ruth and Kelvin Weber took top honors with 7.4375 pounds. Rick and Brennen Longnecker weigh in 5 walleyes for 6.875 pounds for second place. Third place went to Eric and Adam Spray who weighed in 5 fish for 6.625 pounds. Fourth place went to Steve Dahle and Jamie Jahn who weighed in 1 fish for 6.0625 pounds, which was also the biggest walleye of the night. The water on the lake continues to rise and teams had to choose once again if they would fish the North end of the lake or the South end of the lake as boats could not travel under the Milan Bridge. Jeri Ruth and Kelvin Weber took top honors bringing 4 fish to the scales weighing 13.56 lbs, which included the big fish of the night, a 8.1 pounder. Second place went to Chad Strei and Brian Devorak who brought 5 fish to the scale weighing 9.5 lbs. Third Place went to league leaders Eric and Adam Spray who continue to put fish in the boat with 5 fish weighing 9 lbs. Fourth place once again was Brent Zupan and Tom Ludvigson who weighed 1 fish for 5 lbs. Only 15 fish were caught this week. First place went to Dave Cornelius and Jim Roth who weighed 3 fish for 6.25 pounds. Second place finishers were Jeri Ruth and Kelvin Weber who weighed 1 fish for 5.25 pounds, which also won big fish honors for the night. 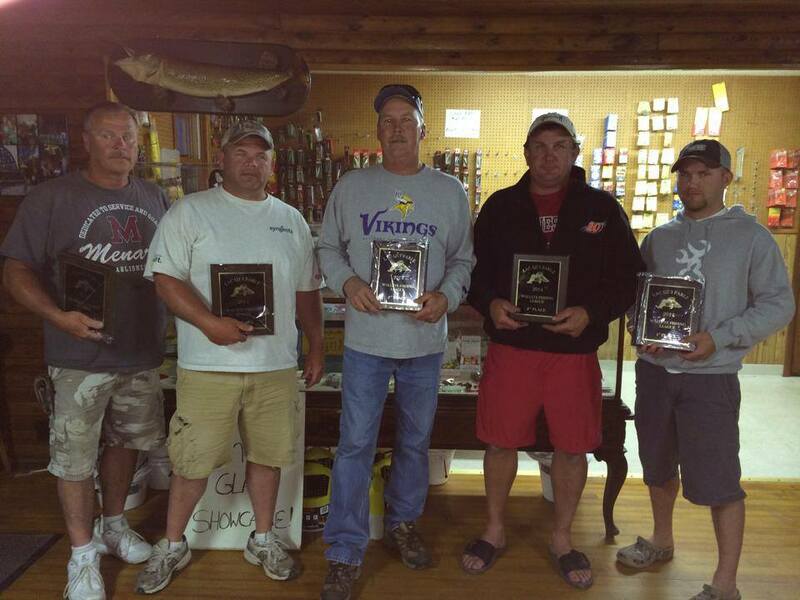 Third place went to Zach Jorgenson and Trent Jorgenson who weighed 2 fish for 5.125 pounds. Rounding out the top 4 was Brent Zupan and Tom Ludvigson who weighed 2 fish for 4.0625 pounds. Next week is the final week of the 2014 fishing league. 7 fish were caught this week. First place went to Tom Ludvigson and Brent Zupan with 7.0625 pounds. Second place finishers were Chad Strei and Brian Devorak who weighed 1 fish for 2.375 pounds Third place went to Steve Dahle and Jamie Jahn who weighed 1 fish for 2.125 pounds. Rounding out the top 4 was Zach Jorgenson and Trent Jorgenson who weighed 1 fish for 1.9375 pounds.